This easy crockpot chili recipe is the best chili for a weeknight dinner or tailgating. It’s easy to make, loaded with flavor, and tastes delicious. And you won’t want to miss turning your leftover chili into Frito Pie on day two! While we avoided turning the oven on for months, the weather has finally cooled off and it feels like fall outside. So, we’ve been spending a lot less time getting creative with recipes that can be cooked outside and reverted to old favorites that can be made inside. But regardless of the time of year, one recipe is always on our monthly menu…chili. And while our neighbors just threw a chili cook-off last weekend with every kind of chili imaginable, when this latest cold front moved in through and I asked my husband what he wanted for dinner, he didn’t’ hesitate before saying chili. Even better, both of the girls are obsessed with my easy chili recipe with ground beef in the slow cooker. An easy, one-pot dish that the entire family loves is pretty rare and makes my menu planning so much easier! This Easy Crockpot Chili Recipe was sponsored by Mirum. Even before coming up with this slow cooker version, my favorite homemade chili recipe has always started with ground beef. Then I add in the basics – Hunt’s, Ro*tel, and Bush’s. I love the rich tomato flavor that the combination of Hunt’s and Ro*tel give the dish. And Bush’s is always my go-to for beans. I’ve tried the store brands and there’s just too much water and not as good of quality beans in my opinion. I like to use a combination of Bush’s dark red kidney, pinto, and black beans. Then I just round out the recipe with some sautéed onion, browned ground beef, and my homemade taco seasoning which doubles as my chili seasoning! This easy crockpot chili recipe is a mealtime staple for me, whether it’s a midweek family dinner or a weekend tailgating feast! If you do the latter, I suggest you try this recipe in Frito Pie! 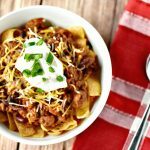 Get everything you need for this easy chili recipe with ground beef in the slow cooker, or if you’re so inclined this Frito Pie, at Walmart! Psst…here’s why you need to use Walmart Online Grocery Pickup and why it’s amazing! This easy crockpot chili recipe is the best chili for a weeknight dinner or tailgating. It's easy to make, loaded with flavor, and tastes delicious. 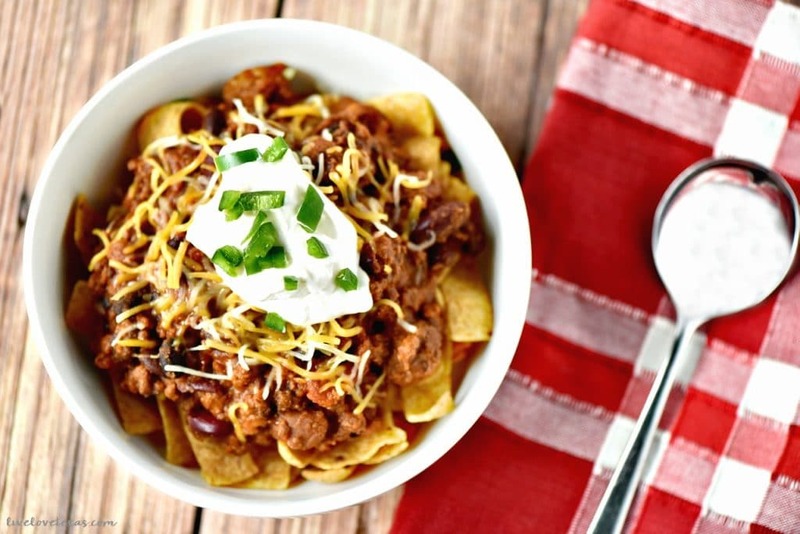 And you won't want to miss turning your leftover chili into Frito Pie on day two! In a skillet over medium-high heat, sauté onions in olive oil until translucent. 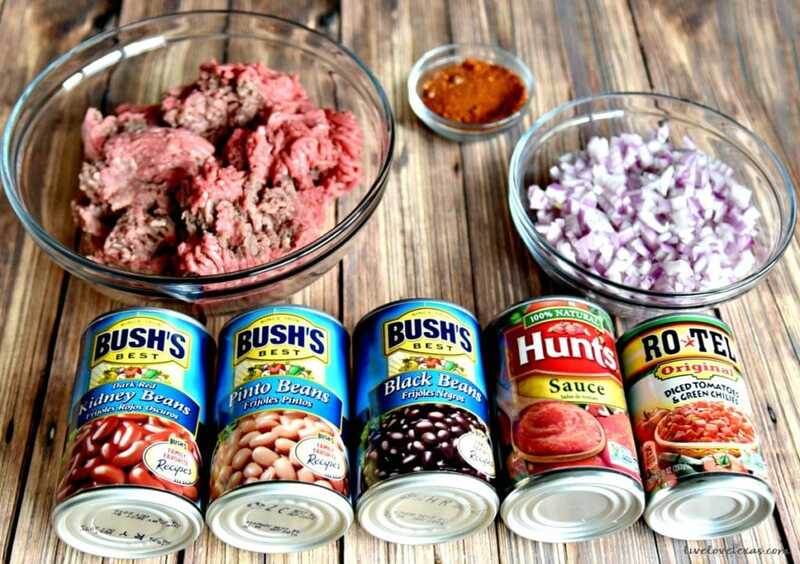 Add ground beef to onions, then sprinkle chili seasoning over mix. Continue to cook until ground beef is no longer pink and place in slow cooker. Add all other ingredients to the slow cooker and stir. Cook on high for 4-6 hours or on low for 6-8 hours. To make Frito Pie: Lay Frito chips in layer on bottom of a bowl, spoon chili over the Fritos, sprinkle with cheese, sour cream, and jalapeños to taste. If you don’t make chili a lot (or even if you do), you might not know that it always tastes better on the second day. That’s where I do things a little different than most people. 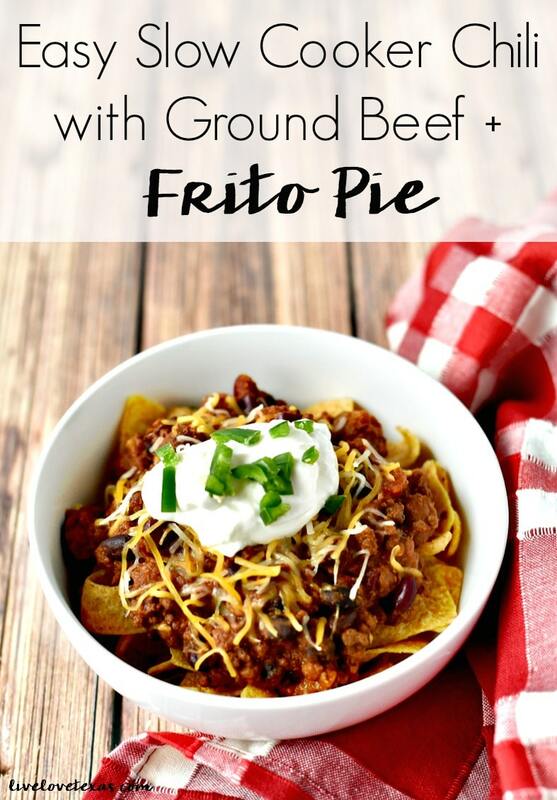 Instead of nachos, Frito Pie, or chili dogs on day 2 as a way to use up any leftovers, my vote is to make Frito Pie the first night and save the plain chili for the second night when it tastes even better! If you don’t know what Frito Pie is, don’t worry. I didn’t either until I moved to Texas, but it’s a staple at lots of restaurants down here. You can either slit a snack sized bag of Fritos open, spoon chili on top, add toppings, and just eat it directly out of the chip bag! Or, if you’re at home, you can sprinkle some Fritos in a bowl, add the chili and the toppings and enjoy that way as well. Pin this easy crockpot chili recipe for later!